Designed for high-quality sound reinforcement, professional recording and broadcasting! Ultra-fast response, very-high output, and virtually no distortion mean every word is strong and clear. Ultra-fast response, very-high output, and virtually no distortion mean every word is strong and clear. Long 16.5" stand mounts instantly to pulpit's XLRF panel, and flexes to easily suit people of any height. The PRO-49QL quick-mount double-gooseneck cardioid condenser microphone is designed to plug into any standard XLRF-type surface or cable connector. With a flat, smooth frequency response and self-contained electronics, Audio-Technica PRO-49QL Cardioid Condenser Quick-mount Microphone features a quiet, fixed-placement, long-life gooseneck and wide-range condenser element with low-mass diaphragm for superior performance. 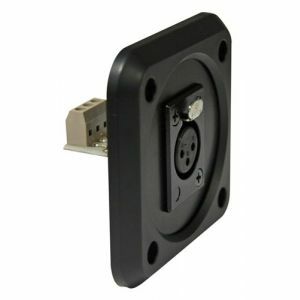 Mount AT8646QM is available as a seperate purchase.